Mission: "We are a nonpartisan, nonprofit “consumer advocate” for voters that aims to reduce the level of deception and confusion in U.S. politics. We monitor the factual accuracy of what is said by major U.S. political players in the form of TV ads, debates, speeches, interviews and news releases. Our goal is to apply the best practices of both journalism and scholarship, and to increase public knowledge and understanding. 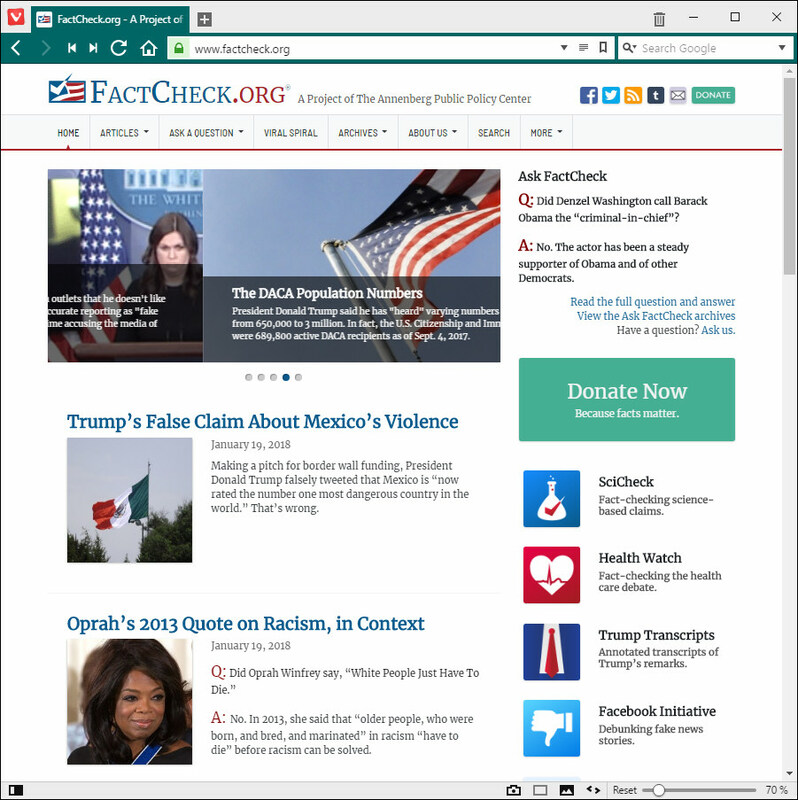 FactCheck.org is a project of the Annenberg Public Policy Center of the University of Pennsylvania. The APPC was established by publisher and philanthropist Walter Annenberg to create a community of scholars within the University of Pennsylvania that would address public policy issues at the local, state and federal levels." Last week I announced a major change to encourage meaningful social interactions with family and friends over passive consumption. As a result, you'll see less public content, including news, video, and posts from brands. After this change, we expect news to make up roughly 4% of News Feed -- down from roughly 5% today. This is a big change, but news will always be a critical way for people to start conversations on important topics. Today I'm sharing our second major update this year: to make sure the news you see, while less overall, is high quality. I've asked our product teams to make sure we prioritize news that is trustworthy, informative, and local. And we're starting next week with trusted sources. There's too much sensationalism, misinformation and polarization in the world today. Social media enables people to spread information faster than ever before, and if we don't specifically tackle these problems, then we end up amplifying them. That's why it's important that News Feed promotes high quality news that helps build a sense of common ground. The hard question we've struggled with is how to decide what news sources are broadly trusted in a world with so much division. We could try to make that decision ourselves, but that's not something we're comfortable with. We considered asking outside experts, which would take the decision out of our hands but would likely not solve the objectivity problem. Or we could ask you -- the community -- and have your feedback determine the ranking. We decided that having the community determine which sources are broadly trusted would be most objective. This update will not change the amount of news you see on Facebook. It will only shift the balance of news you see towards sources that are determined to be trusted by the community. My hope is that this update about trusted news and last week's update about meaningful interactions will help make time on Facebook time well spent: where we're strengthening our relationships, engaging in active conversations rather than passive consumption, and, when we read news, making sure it's from high quality and trusted sources." (From left) The headline Mr Neo Aik Chau edited and the original headline. A man who uploaded a doctored newspaper report on Facebook, suggesting a lawyer -who is an MP from the People's Action Party (PAP) - saved the six people in the City Harvest Church case from harsher sentences, has apologised on social media. Mr Neo Aik Chau, 38, a delivery driver, posted the apology on his Facebook page yesterday. He also apologised in at least two other Facebook groups but not on the public page where he uploaded the doctored report. Mr Neo's apologies came a day after the Attorney-General's Chambers (AGC) wrote to him about the false report. Writing in Chinese on his Facebook page, Mr Neo said:"I swear not to post anything like this again. Please forgive me." On Monday, Home Affairs and Law Minister K. Shanmugam said the AGC considers the Facebook post of the doctored article a case of contempt by scandalising the courts. Originally posted on a public Facebook group whose name translates to "Policy discussion forum", Mr Neo's post was of Chinese evening daily Lianhe Wanbao's Page 1 report with a false headline. The original said an outdated law saved Kong Hee and five others from harsher penalties. The false headline said a PAP lawyer saved them, referring to Mr Edwin Tong, an MP for Marine Parade GRC, who was Kong's lawyer in the criminal trial. Shin Min Daily News reported yesterday that Mr Neo said he was "inspired" by coffee-shop chatter over the verdict. "I'd only meant to put it on the Facebook group as a talking point, and did not have malicious intent. I didn't think it would be reposted," he said. 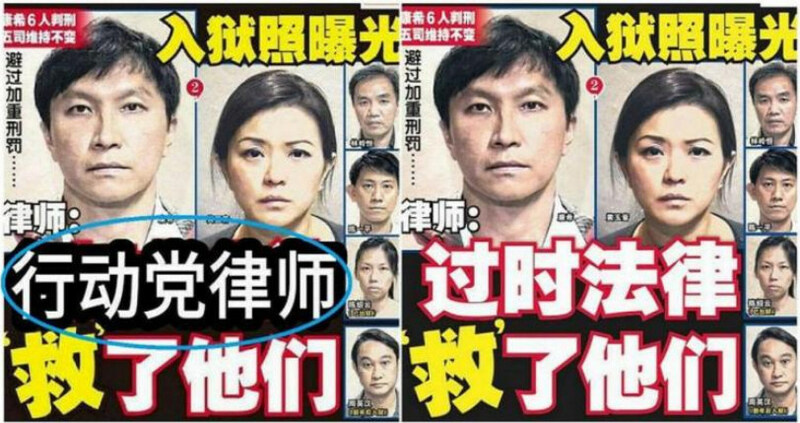 Lianhe Wanbao editor Goh Sin Teck said of the fake headline: "This is not creativity and is a type of behaviour with malicious intent, attempting to mislead the public. It should be condemned." SINGAPORE - When the dispute with Malaysia over maritime and airspace issues late last year was top news, there was a "curious" spike in online comments critical of Singapore on social media, said Senior Minister of State for Law Edwin Tong. These posts were made using what are “essentially” anonymous accounts, Mr Tong disclosed in Parliament on Tuesday (Feb 12). He also said that on the issue of traffic jams at land checkpoints, these "avatar accounts" with profile photos that do not show the user's face account for about 40 per cent of comments on alternative media's social media pages. In citing the jams, he said it shows how foreign actors can interfere in Singapore's politics through online campaigns and false information. But steps are being taken to update the laws later this year to counter such threats. As for the case of the Singapore-KL dispute, he said: "We do not know who these suspicious accounts belong to. Nor do we know if they are being coordinated by foreign actors. "But it is clear that these accounts have sought to give and create an artificial impression to netizens of the opposition to Singapore's position, at a time of heightened bilateral difficulties." Mr Tong was replying to Ms Cheng Li Hui (Tampines GRC), who had asked if there had been instances of foreign interference in Singapore. On last year's SingHealth hacking incident, Mr Tong said the cyber attackers - who are advanced and typically state-linked - wanted to extract the heath information of Singaporeans, particularly that of Prime Minister Lee Hsien Loong. "Cyber hackings are often deployed in concert with hostile information campaigns to search for information that can be weaponised," he added. Earlier, Mr Tong described to the House how foreign actors had interfered in the politics and elections in such countries as the United States, United Kingdom, France and the Ukraine. “No country is immune. This is asymmetric information warfare, fought in a theatre and an era with no distinction between war and peace,” he said. Mr Tong added: “In this battlefield, Singapore, an open, democratic, digitally-connected and diverse country, is especially vulnerable. Mr Tong said many countries he mentioned had learnt “hard lessons” and are taking actions to expose and counter foreign interference. To ward off foreign interference in local politics and elections, Singapore is developing a strategy on two fronts. The first is to sensitise Singaporeans to the threat and nurture a discerning public, he said. "We are our own first line of defence. We must learn to be sceptical of and be able to discern falsehoods or half-truths, and detect foreign actors and their attempts to interfere in our politics." Second, the legal framework - which is "outmoded against modern and technologically-sophisticated tactics" - has to be updated and enhanced to counter hostile information campaigns. Mr Tong said the new laws have two broad objectives. One, to let the Government "act swiftly and effectively to disrupt and counter false, misleading and inauthentic information and narratives spread by foreign actors". "We must also be able to preemptively expose clandestine foreign interference campaigns," he added. Two, to prevent foreign actors from manipulating politically-involved individuals and organisations through the use of proxies, funding and donations, he said. Mr Tong cited the case of Dr Huang Jing, a former professor at the Lee Kuan Yew School of Public Policy, who was identified by the Government as an agent of influence acting on behalf of a foreign country. Dr Huang, who was stripped of his permanent residency status in 2017, sought to influence Singapore's foreign policy and public opinion here. "We must not allow foreign actors to undermine our political sovereignty, nor our ability to make our own choices on how we want to govern our country, and live our lives," he said.